Holy Trinity is pleased to be displaying the art of Michael Moya in the Trinity Gallery . in the gallery (Upper Arts Space at Holy Trinity Anglican Church, 101 St. & 84 Ave.). A collection of contemporary portraits of Jesus and the Saints to promote Christianity in modern Society. The work is done using professional grade markers, pen and ink. The colours are bright and vibrant to provoke a welcoming and loving feel and will help bright up a room when displayed. 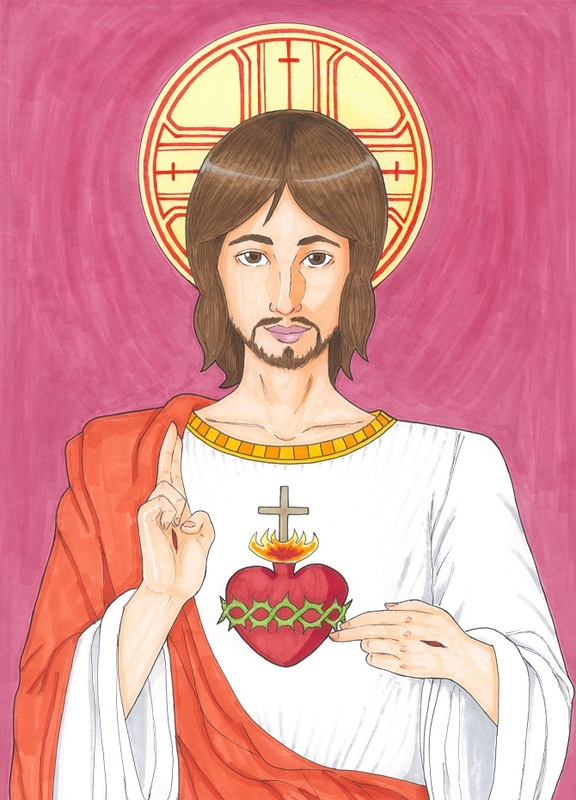 The anime and comic influenced art style helps attract the new generation, bringing more people to the faith and to the stories behind each Saint. Michael Moya is a self-taught artist, born and raised in Edmonton by Filipino parents. Michael grew up playing a lot of video games and learning how to draw from the colourful illustrations of characters in gaming instruction manuals. His style is influenced by Japanese pop culture, mainly from anime and manga. Michael was diagnosed with leukemia cancer in August 2011 while working as a co-op engineering student in Regina, Saskatchewan. His cancer treatment was then transferred and continued in Edmonton, but he was met with complications. In December 2011, Michael was overdosed with chemo and steroids, causing him to go into a coma for almost three months. He was given the sacrament of the sick and the Eucharist in his dying moments, but was then miraculously healed by God, and by mid February he was conscious again. Later on, Michael was then cured of his cancer by going through a stem cell transplant in Calgary. As of recent, Michael is a newly graduate mechanical engineering technologist from NAIT. He runs a landscaping and cleaning business with his family and volunteers regularly at his local church. He now dedicates his time growing his series of saints and other artistic projects.